At times, an uncomplaining gaze can convey much more about life than a hundred words of plaints and pain. That is exactly what happened when I met Mrs Rasheeda, a homemaker from Chennai. For the first time, I realized the price the present generation of elders has paid for our generation’s newly found freedom. The price is loneliness. Many of her contemporaries sacrificed their youth for the larger family, and continue to do so now for their own children. As she explained, many women such as she have been the epitome of sacrifice all their lives. And now, in the dusk of their lives, they find that the needs and ambitions of their children have taken many of them away from the joint family to their own nuclear families. While the others have moved away, her eldest son and his family stay in the old house and take care of the parents. Life is good and she is content, she says with a peaceful smile that touches me deeply. 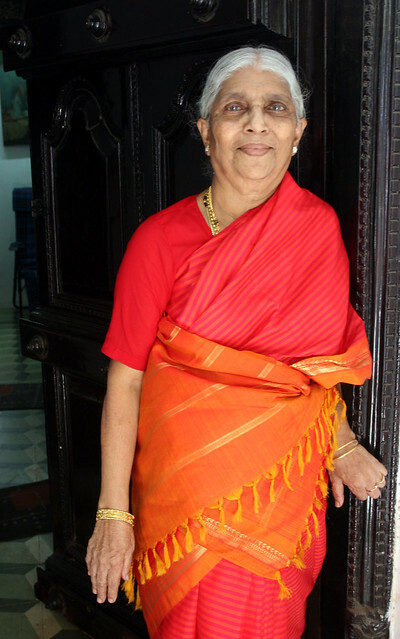 Married to Shaik Adam, she is the mother of nine children, grandmother to eighteen, and great-grandmother to five. Affection and cheer come naturally to her, as does her contagious laughter. Determined to understand what makes her so cheerful, I settle down to chat with her, as her family and friends help fill the communication gap between us, since she speaks only Tamil. And finally, the icing on the cake was the Biriyani recipe which was a pleasant surprise since I did not expect a Muslim family to prefer the vegetarian version of this dish. Tell me Rasheeda-ji, have you always lived in Chennai? Yes, both my parents’ and my husband’s families are from Chennai, in fact from Triplicane, the same locality. Except for one year when my husband moved to Visakhapatnam, Chennai has always been my home. In your time, how easy was it to adjust when you got married? Like most of my elders, I grew up in a joint family. I got married in 1948, even before I became a teen. I think I was all of twelve at that time. Even at that age, I learnt to cook and take care of the house since my mother-in-law was 80 years old and not keeping well. That does not sound easy. How did you manage? I don’t think we thought about life in terms of easy and tough. We just took things in our stride. It is these days that people look at choices. I have to agree with that. Can you tell me how your lifestyle was back then? It was simple. Work, work and work. At that time, rules were very strict, and there was no way we could break them. My eldest sister-in-law helped a lot with the household work. We did all the housework, cooking, washing, cleaning and grinding the batter for idlis. There was no time to think and there was no break. But I still think those were better times. Contentment. Whether we had more or less, it did not seem to matter. We were content with our daily routine. I still remember how I always misjudged the amount of salt while cooking. I would get scolded for that, but I did not mind. I just learnt. How do you keep yourself happy now? I enjoy spending time with the children. I enjoy my evening walks. I have never missed my evening walk at the beach for the past two decades. And the newspaper; I never miss reading the newspaper and like to keep myself updated with what is happening. From what I have heard, you seem to have made some good friends at the beach! Yes, many people of my age walk there. We share our experiences. In fact, when I look at many of them, I count myself lucky. My eldest son and daughter-in-law stay with us and take good care of my husband and myself. In your view, what is the main difference between a nuclear family and a joint family? In a joint family, there are so many people to take care of the children and bestow affection upon them. It is good for the children. But in a nuclear family, one is free. My daughters live in nuclear families and they can do as they like. In fact, nowadays, the joint family system is dwindling. It is a better system in my opinion. We took turns to do routine tasks. I saw a movie in 1949, and the next one I saw was ‘Avvayaar’ in 1953 along with my husband. Those were memorable moments. I also remember how I sat with my husband on the motorcycle for the first time in 1967. I used to walk till the corner of the street where he would be waiting. I would not sit on the bike before the elders. That is so sweet. You would have made a good history teacher Rasheeda-ji with your memory for dates. How can I not remember? In fact, my memories are quite vivid. I notice that none of you is wearing the burkha here. Is your family very liberal? It happened when I went to Visakhapatnam with my husband in 1962. Since no one wore the burkha there, my husband asked me to stop wearing the same. In our family, most of them do not wear the burkha any more. My daughters are also not compelled by their parents-in-law to wear the burkha. Things have changed a lot now. Your family says that you were known to be a tomboy when you were young. My father was always very encouraging of whatever I wanted to do. He was a musician and taught us to sing well and play many instruments. I would love to hear you sing as well as learn one of your favourite recipes – vegetarian please! That would be Vegetable Biriyani. The children in our family love this dish, much more than the non-vegetarian biriyani. Oh wow! This is a real treat. Is this your family’s traditional recipe? Not really. This was not a common dish. It was generally prepared by cooks during weddings. I learnt it from them. At home, the common dish is Brinji which is rice tempered with onions, ginger and garlic. First published in Oct 2012 in Harmony – the magazine for senior citizens for the column – The Great Granny Diaries. Part-2 of this post is Vegetable Biryani from the kitchen of Rasheedaji. She is the second grandma featured in this column.